President Maithripala Sirisena, in a letter to UNP Leader Minister Ranil Wickremesinghe, has formally informed that the latter has been sacked from the Prime Minister’s position. Sirisena has informed Wickremesinghe that he has been sacked from the position according to article 42(4) of the constitution. However, making a public statement from Temple Trees, a short while ago, Ranil Wickremesinghe said he was still the Prime Minister of the country as he has clearly demonstrated his majority support in the House. 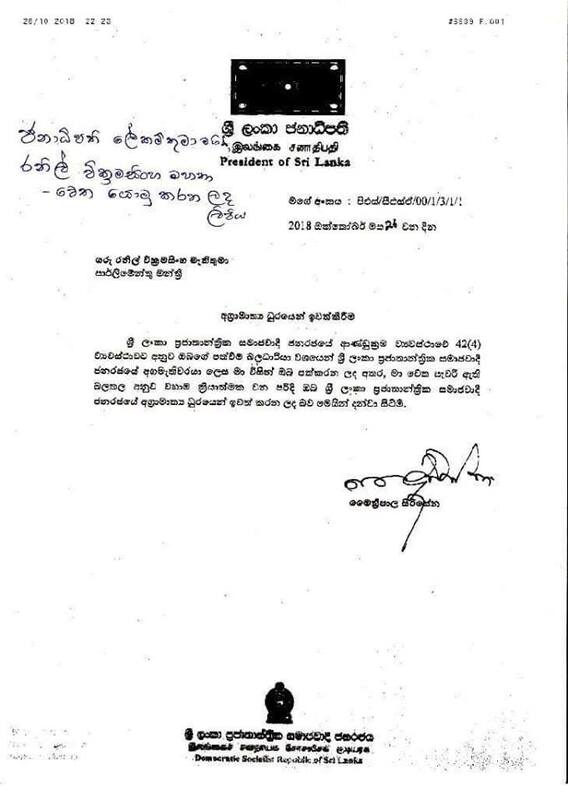 The letter has been been faxed to the Prime Minister’s Office at 10.22 pm, nearly three hours after former President Mahinda Rajapaksa took oaths as the new Prime Minister. Mano, You are pleading. …. May this crisis be resolved justly and according to the constitution. I wonder if anyone that matters knows what is in the constitution. If they did, they would have avoided this crisis, wouldn’t they have?